Clicking a link below scrolls you to that section. '01 / '02 1700 machine. Wheel drive, picking table. Must be in tidy condition. Photos to sales@stpe.co.uk would be a great help. We have more information on used Reekie bedtillers, used Grimme bedtillers, used Standen bedtillers still on farm across the UK. Please contact us for more details. 3.8m twin bed fixed tiller. Friction clutch PTO protects 200hp heavy duty gearbox. 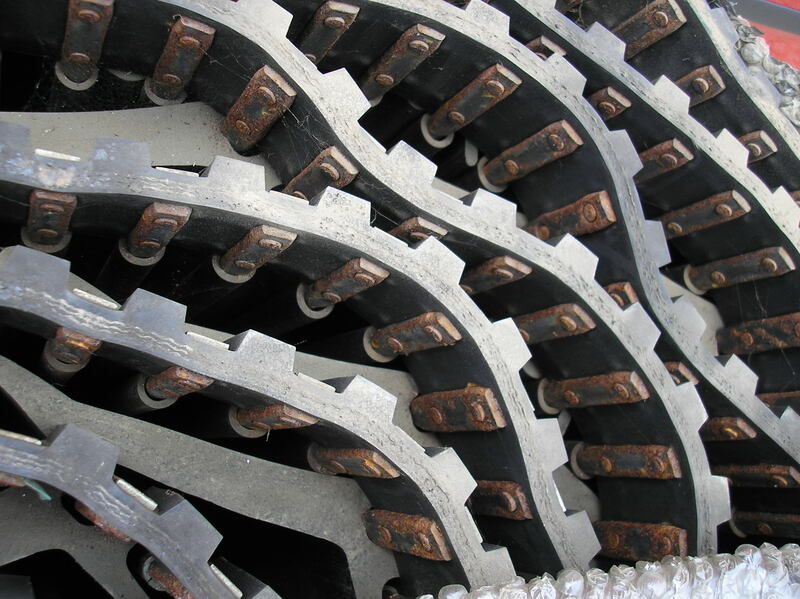 Hardened gear train at both ends of the machine, with steel bearing housings and large bearings. Specially coated, hardened speedblades fixed with reinforced mounting clamps. Suits 2 or 3 body bedmaker to make a bed and 2 halves or 2 full beds. Spiked rotor with Dowdeswell, Grimme orange shearbolt ploughs. Single bedtiller with spikes and auto reset bodies. Butterfly style twin tiller with shearbolt ploughs to rear and Techneat nematacide applicator to be removed. Fitted with speedblades and shapeforming ploughs. Can be used as a double, if required, without the centre tiller. 3 Microband tubs, 6 fishtails, land driven spiderwheel. Sensible tidy machine with blades at 50%. Generally tidy, good blades ready to go. Twin rotor for carrots / onions, or other crop to be drilled into a flat top bed. 3.8m inter row hook tine cultivator. Set for 4 x 36" rows. 1000 RPM input. 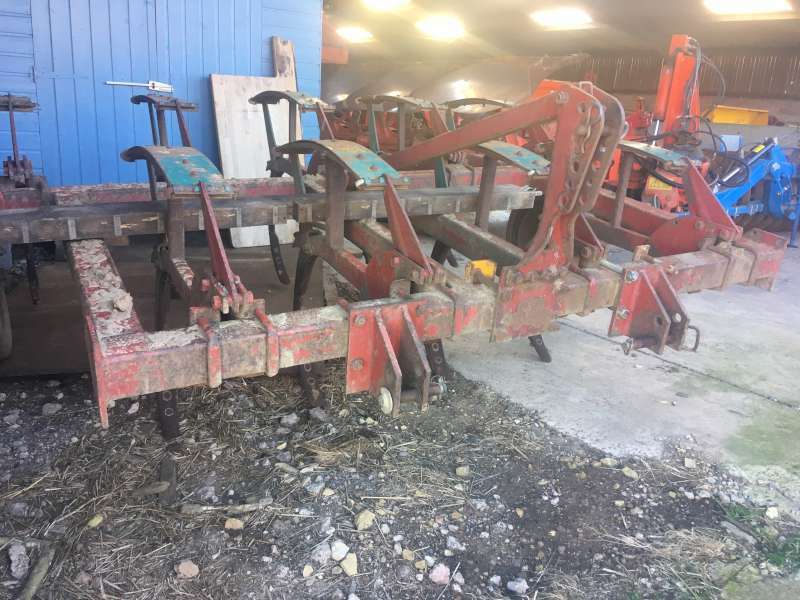 Full width single bed clamp on hook tine cultivator with depth wheels and Reekie shearbolt ploughs attached to the rear. All repainted in Reekie red. Tidy machine with excellent tipped hooks. 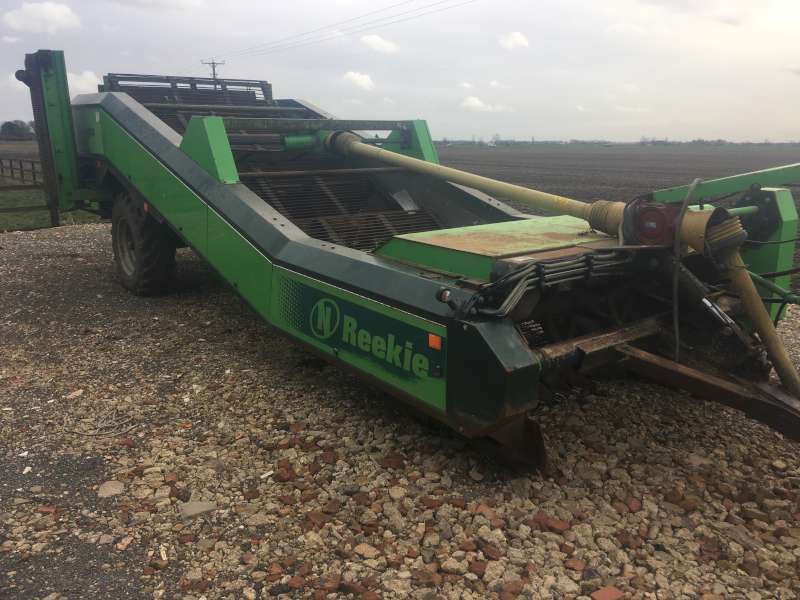 Bedmakers We have more information on used Reekie bedmakers, used Grimme bedmakers, used Standen bedmakers still on farm across the UK. Please contact us for more details. Single shearbolt bedmaker with hydraulic markers and Agriweld Bed Buster. Shearbolt bodies, manual folding markers. Shearbolt protected triple with hydraulic folding markers and convex ploughs. Triple shearbolt bedformaer with hydraulic makers and read lights. A proper bit of kit with oodles of life in all the metal. Not been broken anywhere. In need of a good tidy home to match where it has been. Basic shearbolt protection, single bed, with markers, painted Grimme orange. Basic shearbolt protection, single bed, large bodies with wide foot, painted Grimme orange. With fertiliser hopper and spring tines. 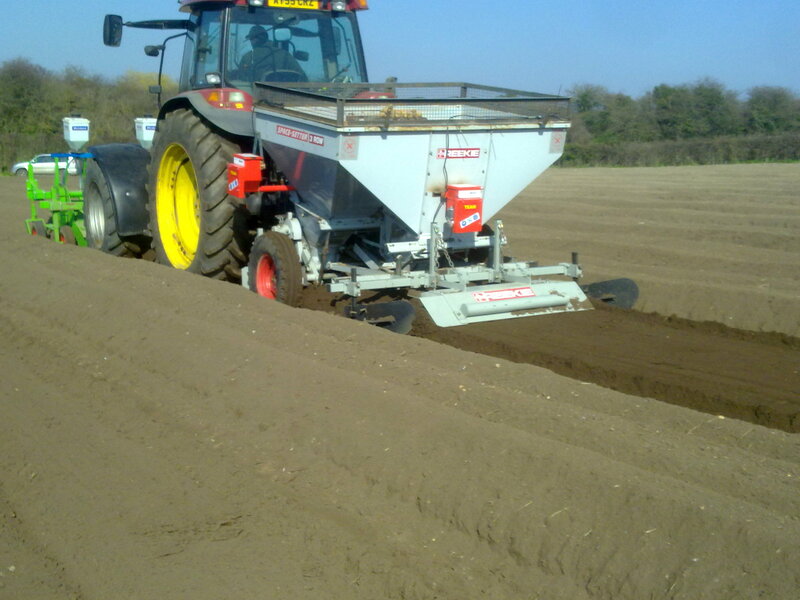 Ideal for pulling level ploughing to reveal stones prior to bedforming. Separators We have more information on used Reekie separators, used Grimme separators, used Standen separators still on farm across the UK. Please contact us for more details. Sold by us a few years ago, but still a tidy little number. Sorry about the photos, but dark sheds are dark. Other than requiring a good wash, this machine is fit for work. Good shares, discs, stars and web drive rollers. The cross conveyor is straight. 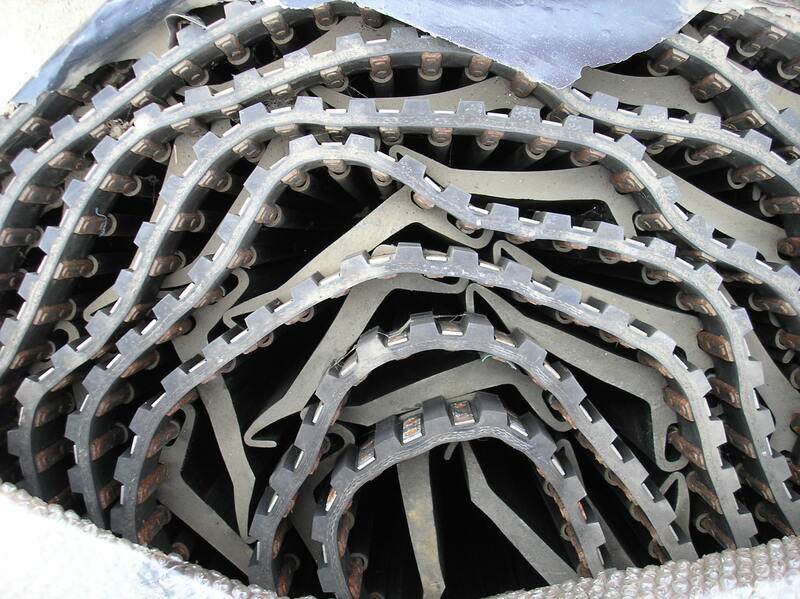 Drive chains are all serviceable. Clearly a machine that has been looked after by its two former owners. Damaged front roller is to be replaced. As new front end and stars. Planters We have more information on used Reekie planters, used Grimme planters, used Standen planters still on farm across the UK. Please contact us for more details. New Reekie mechanical planters left in stock for this spring. Cup planter, large capacity fixed hopper, shapeforming hood, miss indicators. With shapeforming hood, set for 36" in 72" wheels. Hydraulcially driven 2 row planer with tipping hopper, shapeforming hood and soil boards. 6 row planter including low loader trailer. Pressurised hoods, folding drawbar for transport, lanes adjuster on drawbar. Barn stored. 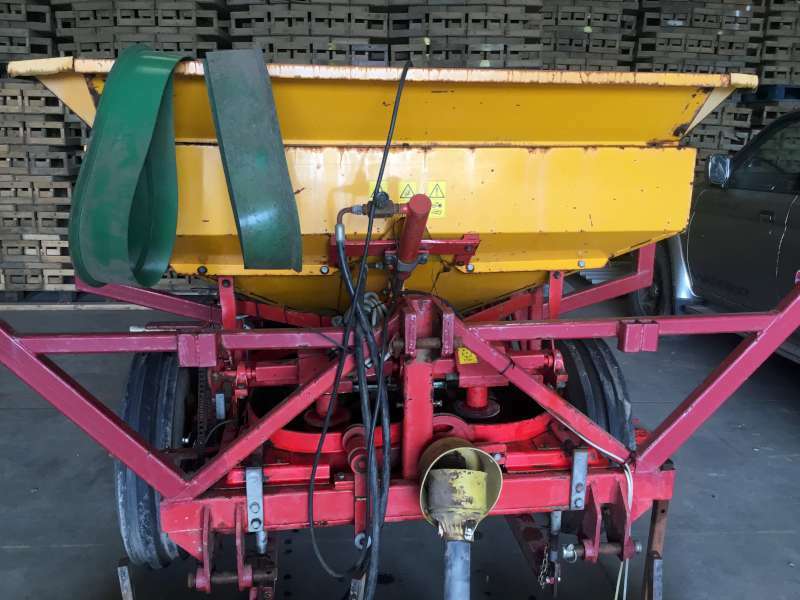 3 row planter with mechanical drive and manual depth control. Properly converted back to 2 rows from 3. Space select, full bed hood. Hydraulic drive, depth sensing, covering hood, hopper extension, Amistar kit. Ideal for large and difficult shaped seed. Has been converted from hydraulic to mechanical, but can be put back. 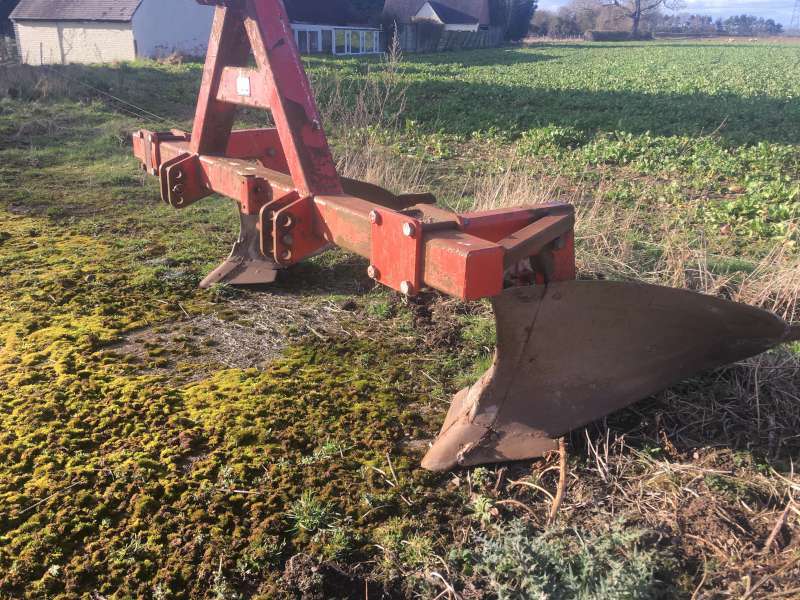 Owned from new, used on Fenland silt. 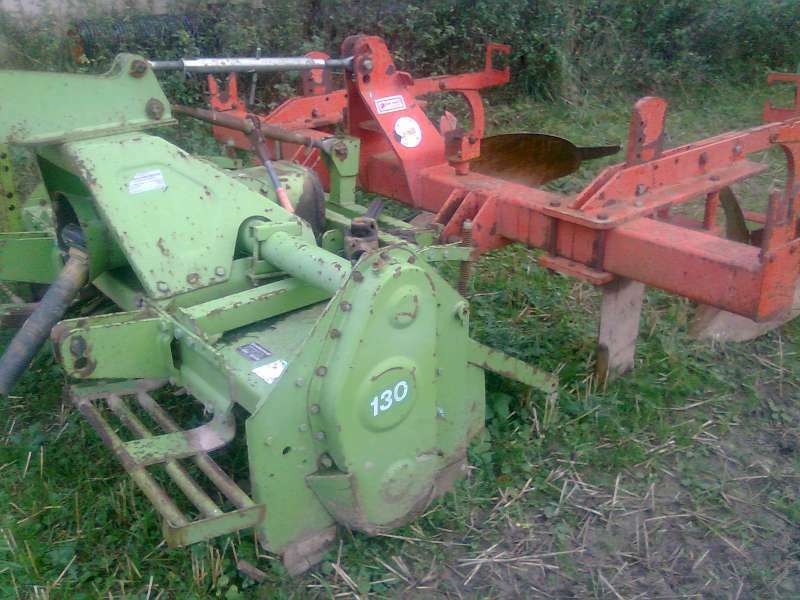 Currently fitted with ridging plough coverers, but can be fitted with a hood. The fertiliser boxes are all tidy and have had the drive chain disconnected 4 years ago when alternative application was used on farm. 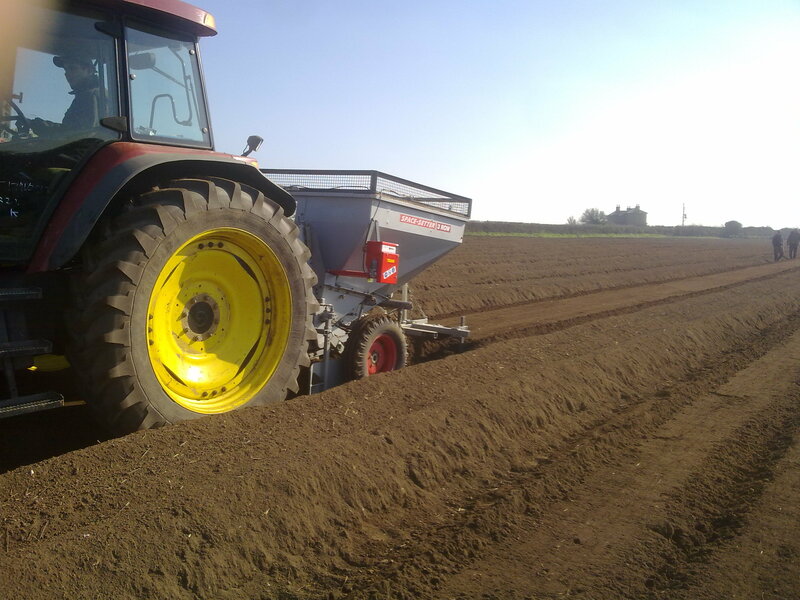 Applicators We have more information on used Applicators still on farm across the UK. Please contact us for more details. If you have an applicator for sale, send us the details and a few photos, we're happy to put them on our site with no obligation. Anything from: Agrobands, Placement Pros, Amistar Kits, Monceren Kits etc. 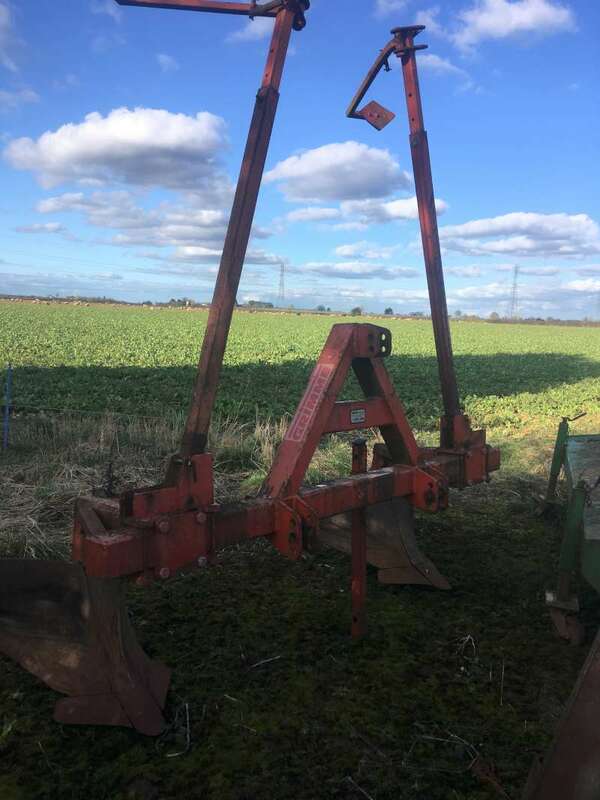 Haulm Toppers We have more information on used Reekie toppers, used Grimme toppers, used Pearson toppers still on farm across the UK. Please contact us for more details. Presented in mint condition, with blades set for 36" rows. Front mounted, side conveyor, contoured blades. Front mounted topper with contoured blades for 34" rows. Front mounted with side conveyor & contoured blades. 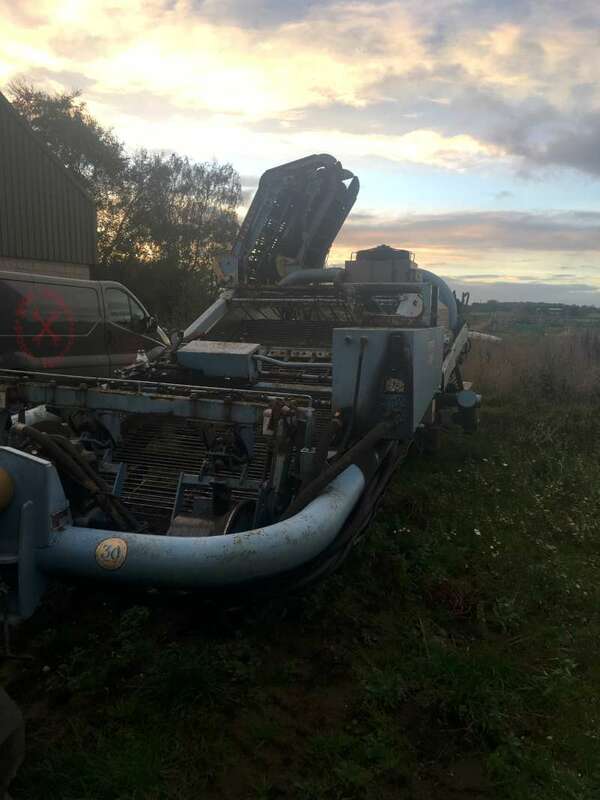 We have more information on used Reekie harvesters, used Grimme harvesters, used Standen harvesters still on farm across the UK. Please contact us for more details. Ex demonstration machine with full specification. Wheeldrive, picking table, windrowing, full width share, hydraulic haulm roller adjustment, hydraulic RS table adjustment, powered half diablos with ridge pressure control, box filling chute. Picking table, wheeldrive and full CanBus electronic controls. It has been owned from new and driven by the same driver from day 1. It is equipped with half diablos and full width share. As photographed, it was last used for digging buried potatoes in a windrow. Ridge pressure control is fitted over the diablos and sweeping clod fingers help break up the ridges if necessary. The Cleanflow table is the industrial heavy duty type, with an excellent pintle belt over. The whole machine is in working condition, the camera kit comes with the machine. Goes in the 3rd position. 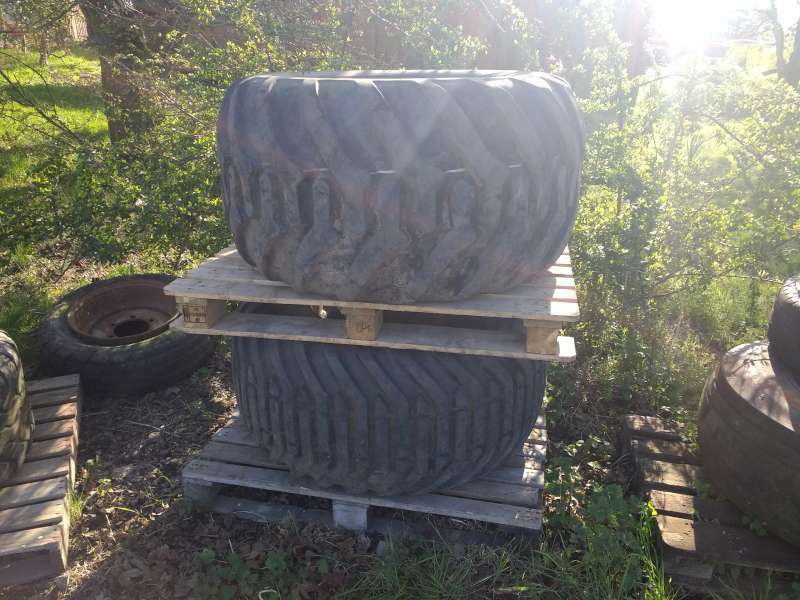 1700 wide so will suit a 2170, 2172, 2174. Twin MultiSep, wheeldrive, picking table & web drive. 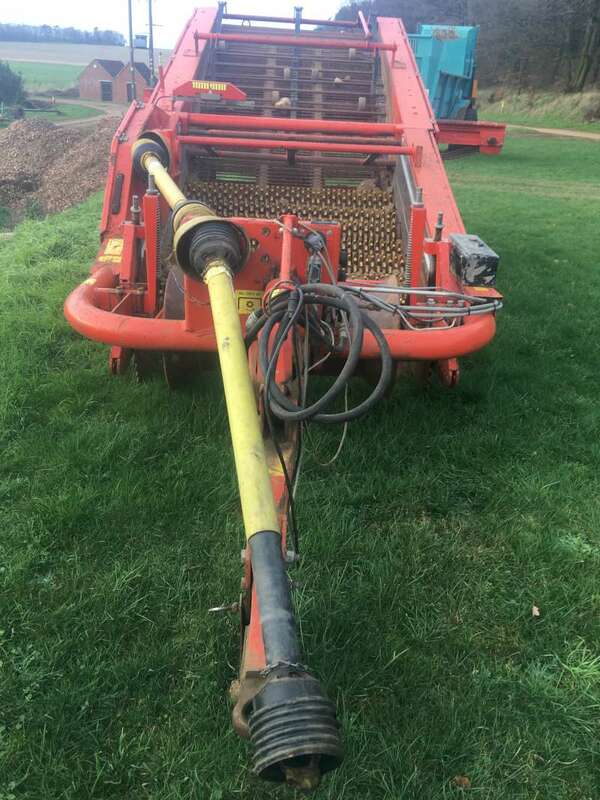 This excellently presented and maintained harvester has been carefully owner driven since it was delivered to its South Lincolnshire farm in 2013. The specification is GT S, unmanned with wheeldrive and hydraulic web drive. Intake arrangement is currently set for digging conventional 36” rows with rubber wheels following the ridges with Terra depth control. The alternative of full width digging with centre share is available as an option. Intake web is 35mm. The main is 45mm with hydraulic oscillating fingers over. Crop passes onto the RS table with 80mm plain rollers and TwinSep bypass over, then MultiSep. Elevator has left hand windrowing. Machine has left hand levelling and full UK road lights. The cameras fitted will be left on and the two in cab monitors will come with. Any grower considering a new machine to this specification should give this oner serious thought and potentially save a packet. non wheeldrive, unmanned, single MultiSep. Full width digging on half diablos with auto ridge pressure sensing. 50mm main web with oscillating fingers over. Wheeldrive, picking table & box filling chute on elevator. A straight machine in full working order. 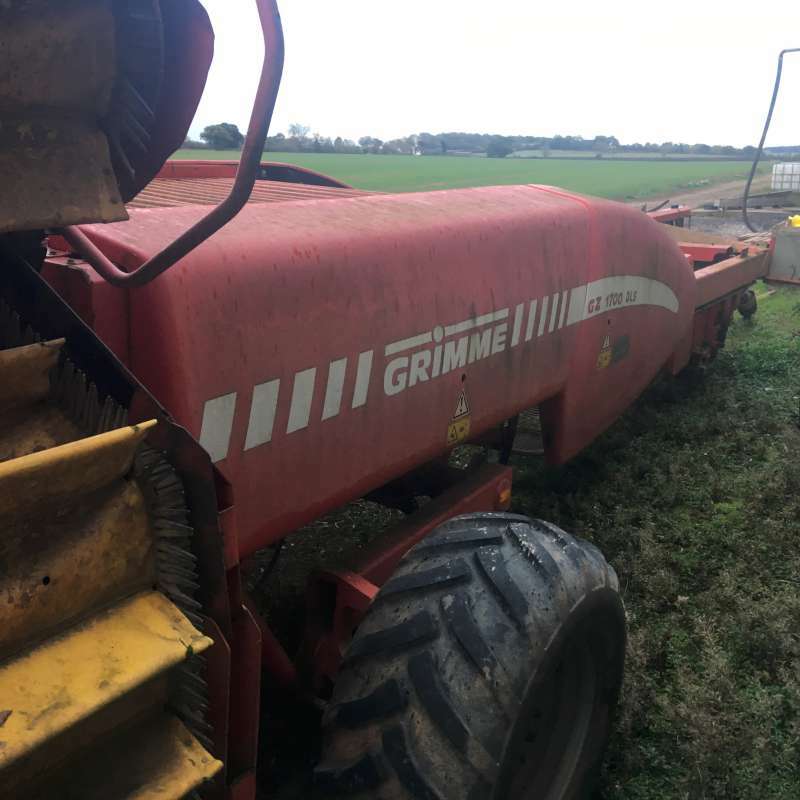 Typical Grimme paintwork for year. Wheeldrive, picking table, RS rollers. Full width share, auto ridge pressure control, 540/1000 rpm gearbox, 2nd agitator under main web. Canopy over picking table. Slight damage to cart elevator rests. Dry wheel motors. Needs a good wash but generally in working order. Non wheeldrive, full width share, half diablos, auto ridge pressure control. Main web 40mm, 2nd 36mm. 70mm RS rollers. Auto levelling, self centre steering, elevator windrowing on LHS. Axle configuration has the optional extra, factory fitted, to extend hydraulically to span a full bed. 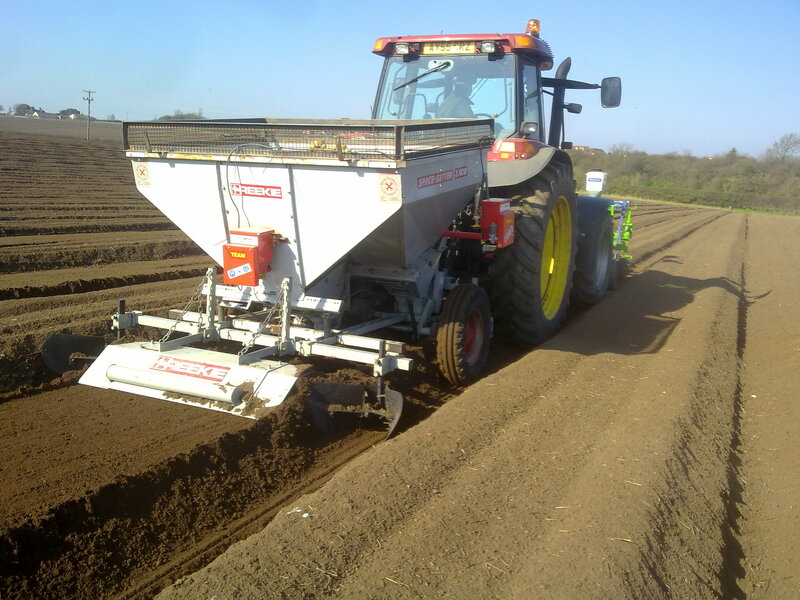 Suitable for 3 rows planted in a flat top bed, or when the machine is used on carrot, parsnip or onion beds. Oscillating fingers are also fitted over the main web. 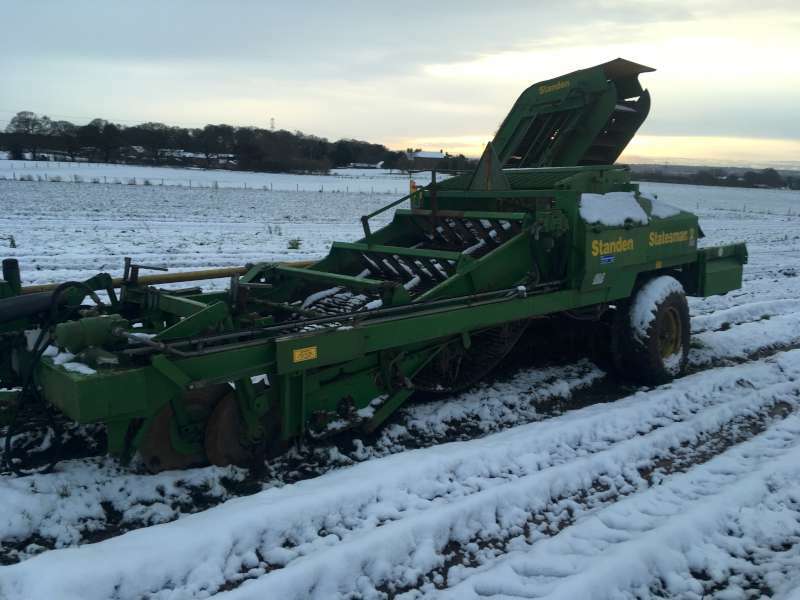 Whilst the machine is currently unmanned, a 1500 picking table is available. Sold by us some years ago to a local small acreage grower, it hasn't been used now for a few years. Machine has remained barn stored along with some other clutter that has been put on or around it. 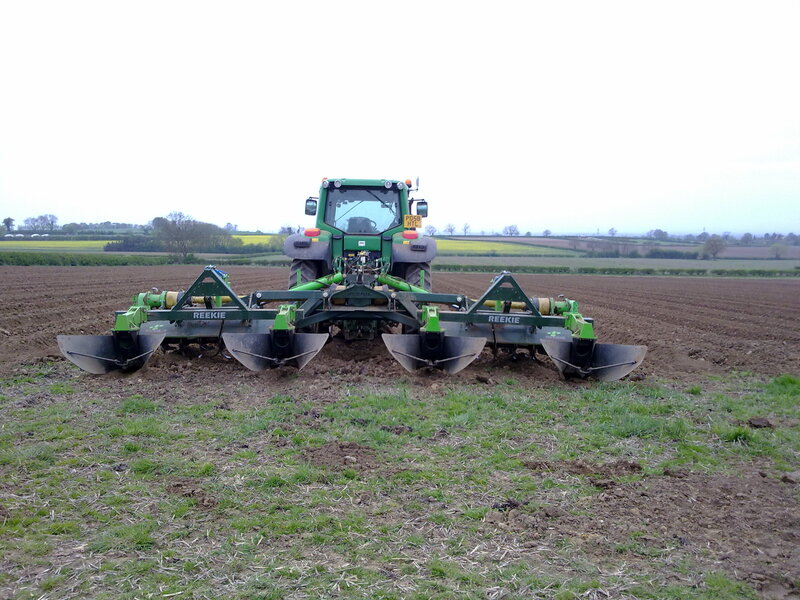 A nice tidy machine with conventional digging, currently set for 30” rows in 60” wheels. Self centre steering & ridge pressure control. 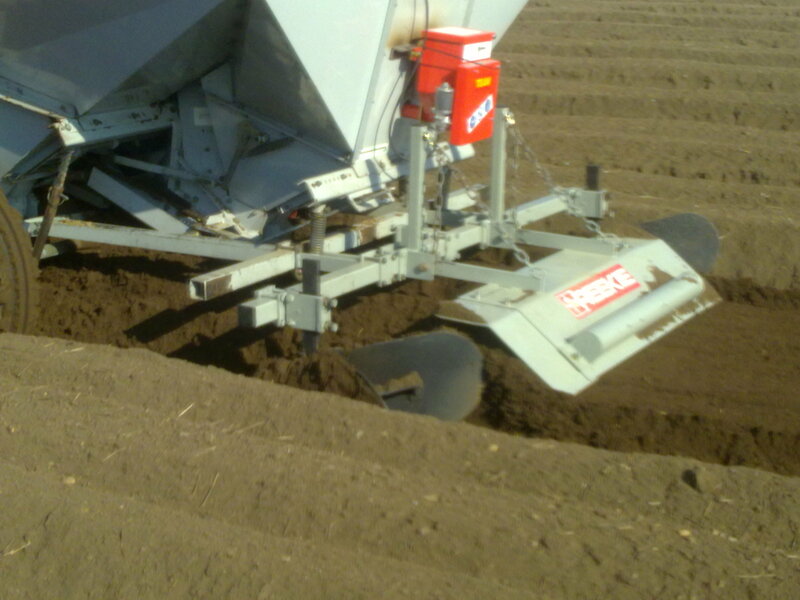 Set for conventional digging on 32" rows, wheeldrive with RS & picking table. Sweeping clod fingers over the main web. Altogether a good working machine. Just finished 2017 harvest when photographed. This machine is set to dig conventional 36" rows and has been lifting on Lincolnshire silt for many years. As such, it has a web module in place of the RS table, which is also available. All standard features present and correct. Stored in last used condition from '15, it just needs a wash and can go straight back to work. Haulm rollers, fingers and web drives all serviceable. Dahlman table separation and cross conveyor. Haulm extraction by Deviner web. Full width share for 34"/36" rows. Depth wheel sensing behind the tractor wheels. A very tidy machine with a reconditioned separator table gearbox. 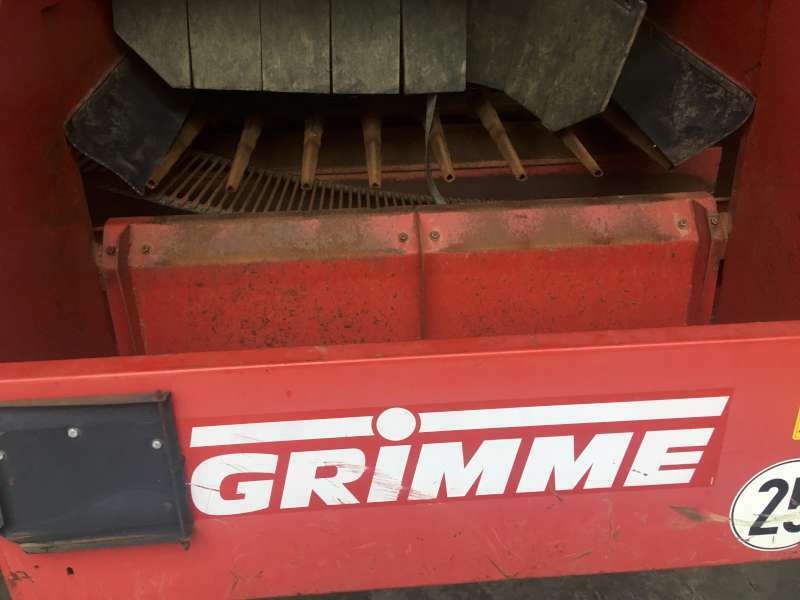 A genuine Grimme machine, not a conversion. Wheeldrive and 3rd wheel under machine connected to the steering system. Shame about the paintwork, which is sadly representitive of the brand in this era. However, it is a good solid machine, having spent most of its life on black moss, hence the big flotation wheels. With twin head air weigher. Photographed part way through a service, with new parts still to be fitted. A good and tidy machine when service completed. Converted from the Grimme AllRounder. This is a sound conversion with left hand levelling added in addition to the reversible cross conveyor. Set up for full width digging on full diablos, rear wheel steering, traditional machine levelling on the right with wheels to follow the tractor at 72". A very sensible proposition to gently windrow the crop ahead and enhance harvester performance. 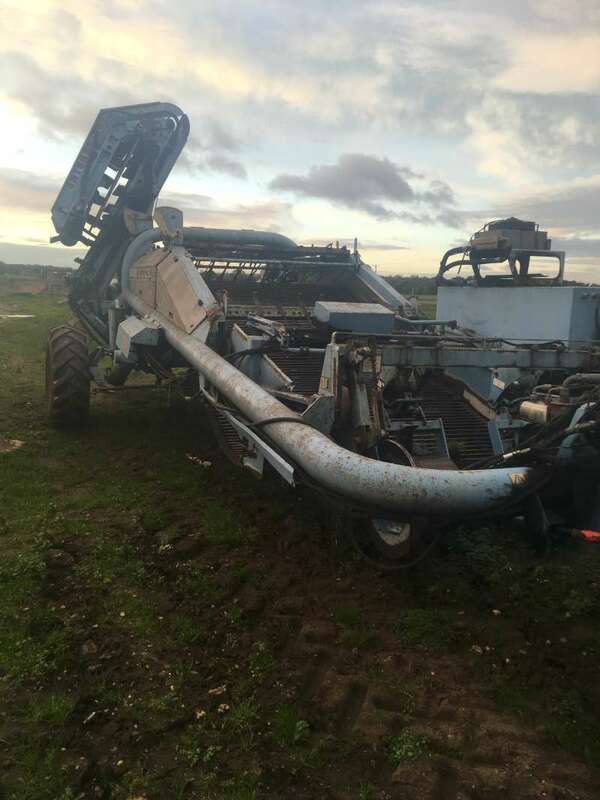 This machine has come to the market as the owner has ceased growing after 2018. Set for full width digging with 36mm intake web and a 45mm main web. All functions hydraulically controlled and it has the reversible goal post axle. The cart elevator has the windrowing attachment. I have taken video footage of the machine running, pretty amateur, and the only problem I detected was a badly adjusted Dahlman scraper which screeched at low revs, but when at operating speed wasn't as bad, a little adjustment is required. An early example with 2 webs and the ProClean (Dahlman) table. Used for 2018 and now no longer required. A basic machine needing some work on the ProClean table. Barn stored as a spare in fully working order. Conditions prevent further harvesting currently. New 45mm digger web & sprockets fitted. Trailed, top lift machine. Website. Mobile grader with 7ft hopper and crop height sensing. This machine has all variable speed motors, controlled by inverters. Comprehensive electrics allow for box filler to be connected at delivery end. Spare sockets are available to allow for a waste elevator. 50ft long with hydraulic braking from tractor to axle. All electric varispeeds controlled by inverters. To be fitted with screen of new customer's choice. Also requires a geared motor to drive the smalls / under size belt. Although not present, provision is available for conveyor to be fitted across the end if required. Varispeed agitation and varispeed drive to screen. Only requires a new owner to decide screen size. Stainless construction, in need of a wash. Conveyors stored separately. Altogether a very nicely presented, well refurbished bit of kit. Side conveyor for graded produce to be fitted along with screen of new customer's choice. Graders We have more information on used grading systems still on farm across the UK. Please contact us for more details. Mobile grader with adjustable coils, picking belt with stands and rejects conveyor. 48" grading module with end discharge chute. Hopper, screen with under conveyor, roller inspection table with picking stands. Presently fitted with a 42mm grading screen. Single screen, 3 phase. Roller table has 2 way bag holders on the roller sorting table and side table. It's a genuine little machine. In recent years, it's only been used for split grading off the side table of a 4ft machine for seed. 10ft long, 3ft wide flat belt with turning facility. Lights over & picking stands. 2 waste conveyors under. 1 usable, 1 unusable. Both fixed speed, reversible. Crop then passes onto the grading screen with varispeed motor & long tuber handling device. Side conveyor under with fixed speed motor. In addition, a free standing 3ft sizer is attached to the rear of the machine, thus allowing seed or oversize to be taken. Rod link cleaner with under chute. Twin screen grading module with side conveyors. 2ft wide roller inspection table. 6ft lg. 20 row x 2ft dry brusher with 3phase fixed speed motor and adjustable height legs. 8ftx2ft roller table. 3phase speed motor. Tong 1025 3phase weigher with inline bag holder, can be turned 90°. 6ft 3phase bag conveyor with Newlong fixed head stitcher. With conveyors. Used as an oversizer with bypass option. We have more information on used hoppers and cleaners still on farm across the UK. Please contact us for more details. With cleaning conveyor in bottom of hopper. The hopper on legs has varispeed control. It has 2 tonne capacity with the ability to feed straight onto the grader. If you have a hopper for sale, send us the details and a few photos, we're happy to put them on our site with no obligation. Conveyors We have more information on used conveyors still on farm across the UK. Please contact us for more details. Hydraulically adjustable lift and lower main boom. Sorry it's in a dark shed. Small feed hopper, flighted belt. The usual spec. of a machine of this nature. Powered, slewing etc. Located in North Yorks with a grower who has given up. 12ft reversible conveyor with 3pahse electrics. Each end of the conveyor is manually adjustable downwards to decrease the delivery hight if necessary. Veriable speed motor & adjustable legs. 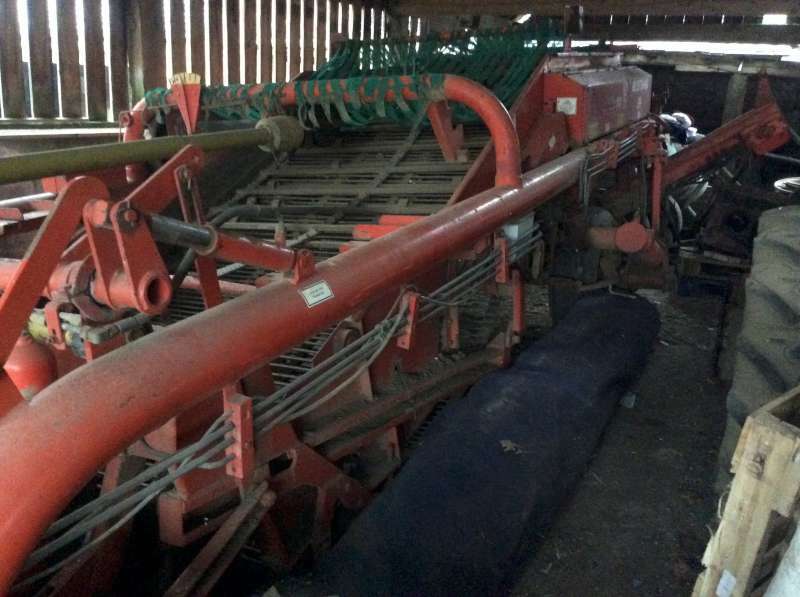 We have more information on used store equipment still on farm across the UK. Please contact us for more details. Early model for 6ft x 4ft x 3ft boxes. Too tidied up on electrics, but still a good runner. Weighing & Bagging We have more information on used weighers and baggers still on farm across the UK. Please contact us for more details. With V track automator & stictcher. 10 tonne / hr machine. Good belts, ready to go. Foot pedal with cable to jaws. 3phase. Sensible machine with good belts etc. 3phase. 10 tonne per hour throughput. Consisting of 2 separate units that operate in sequence from a separate reversing conveyor (not available). All aspects of the machine are sound with infrared protectors on the guards. There are no load cells with the machine. 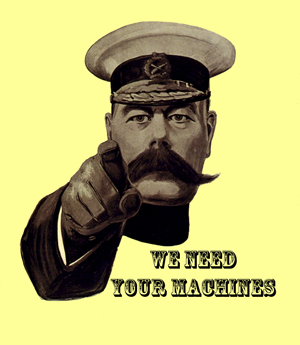 Washers We have more information on used store equipment still on farm across the UK. Please contact us for more details. If you have a washer for sale, send us the details and a few photos, we're happy to put them on our site with no obligation. Brushers / Drier We have more information on used store equipment still on farm across the UK. Please contact us for more details. 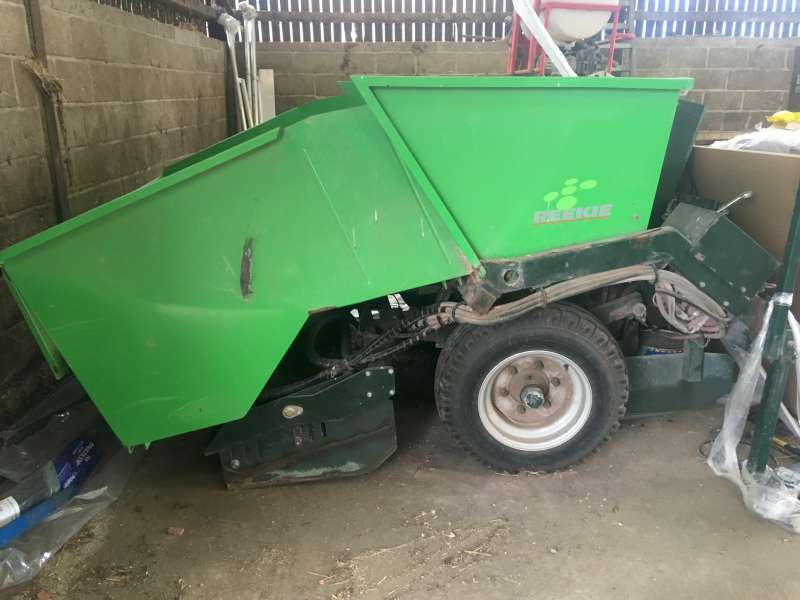 If you have a brusher or drier for sale, send us the details and a few photos, we're happy to put them on our site with no obligation. Machinery We have more information on used machinery still on farm across the UK. Please contact us for more details. Pumps water, I bet. Would fill paddling pool fast. Variable speed carborundum rollers and screw. Just as it finished work, needs a wash it part of a small peeling line with soak tank for preservative and a hopper for feeding peeler. 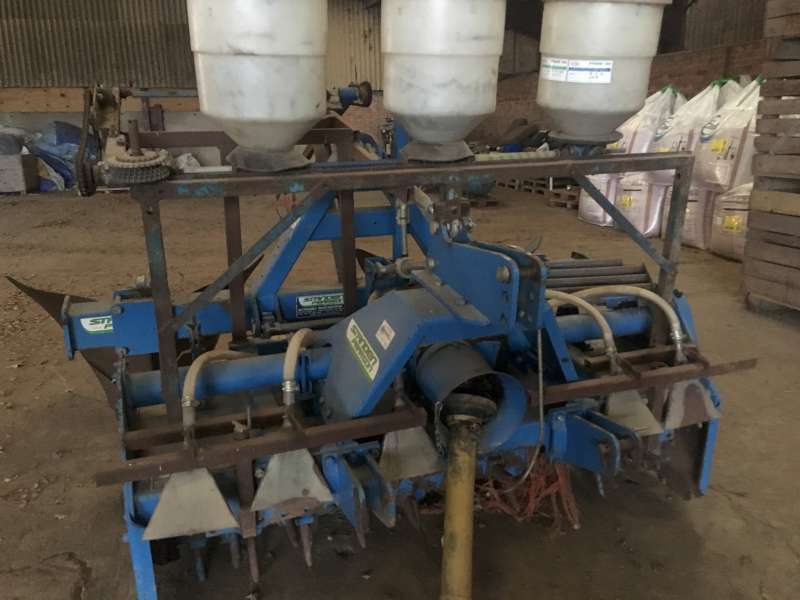 4 row twin line carrot seeder with twin Vydate applicators. 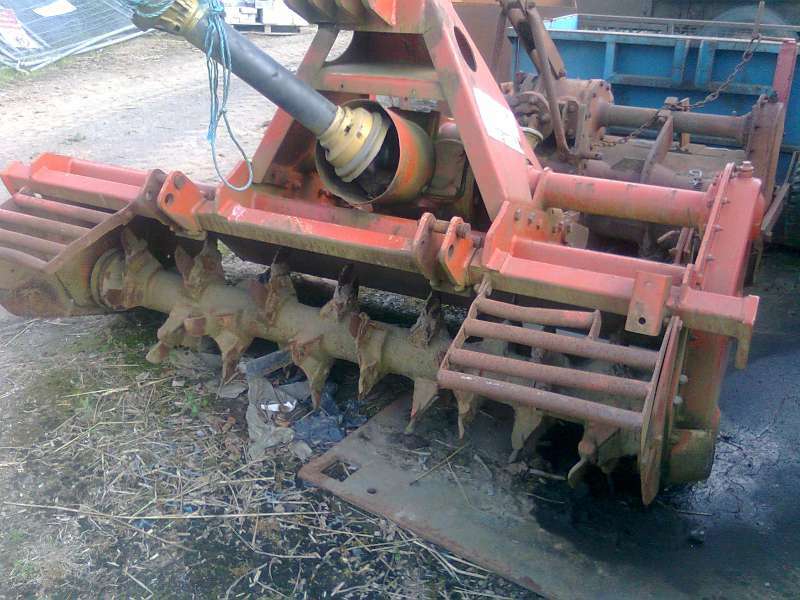 Spare seeder plus other assorted spares. Highly effective style of covering hood, tailored to suit your machine, producing a flat top bed. 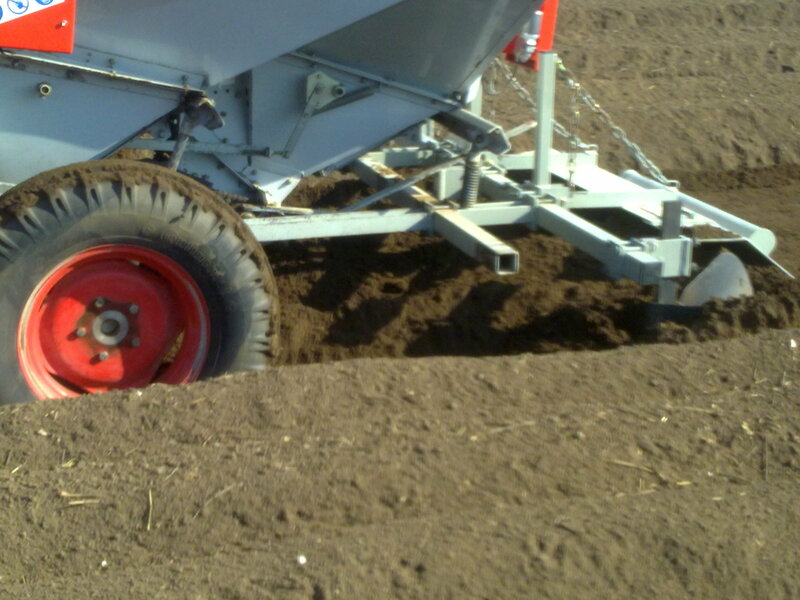 Shown here fitted to a Reekie 3 Row Spacesetter Planter. 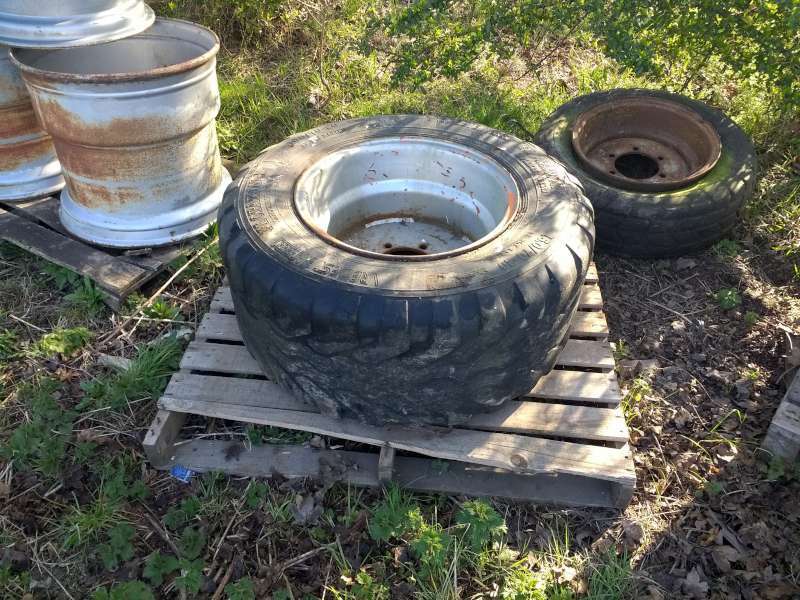 Wheels We have a wide range of used wheel assemblies. Please contact us for more details. 6 stud rim with offset. Webs & Stars We have a wide range of used screens and webs. Please contact us for more details. Brand new, still in manufacture's packaging. Reekie part numbers RPH2127 & RPH1961. 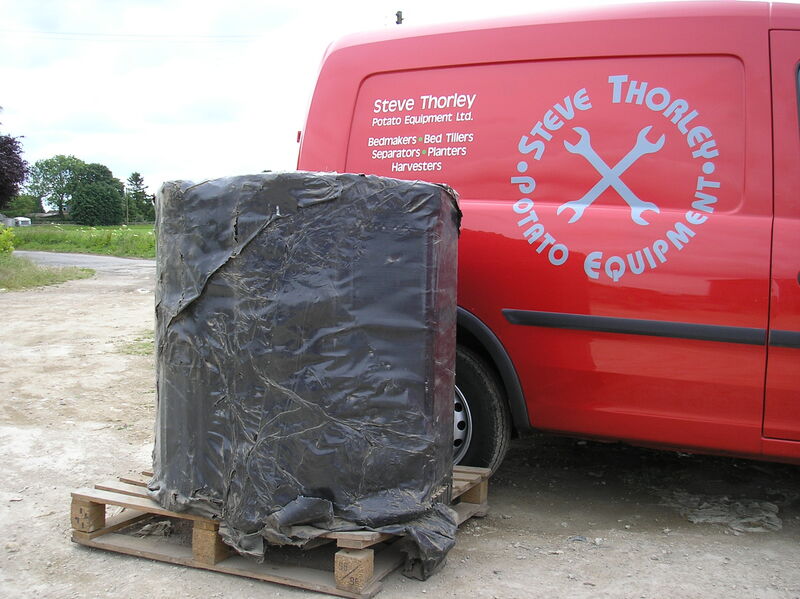 We have stock of used 2ft - 6ft grading screens, in both metal and plastic. A wide range of lengths and grading sizes available. We have stock of used webs for a variety of machines in different widths and pitches.